*This car is for sale as a Classic Showcase restoration, equal to our driver/show-driver/show restoration levels. Please see our restoration page for further information. 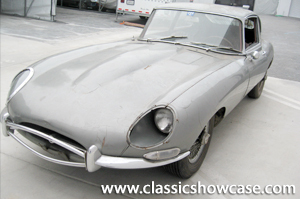 This car is a great candidate for a full restoration. The car has rust in the body and the back window glass is broken. It is not currently running or driving and is 99% complete. This is a great opportunity to have a vehicle restored to your desires and specifications, or restore as your own project. The Series 1 4.2 2+2 is the most user friendly, and very collectable E-Types. These wonderful cars had a 4.2 liter engine with 3SU carburetors and a fully synchronized transmission. Some of the features of this model are covered headlights, toggle switches, full instrumentation with styling and design that was way ahead of its time, center console, arm rests, and full synchronization transmission. Other features of this Series 1 are its steep windshield and tail lights, which are placed above the bumper line in the rear deck. Similarly, the parking lights are above the front bumper line in the front fenders. A chrome strip beneath the windows on the doors identifies the 2+2. This car first came on the market in 1966 in response to US market pressure for a vehicle with a backseat. The 2+2 was also the first time this vehicle was offered with an automatic transmission which became an option because of the extended length of the vehicle, which permitted the transmission to be installed. In 1964 when the 4.2 was tested, fuel consumption was rated road reported at 22 MPG and a top speed of 140 MPH.